Caves and Tunnels, Water, and Buried Treasure! A resistivity survey is done by simply moving the probes outwards and taking multiple readings. For example, start probes at 1 meter, take a reading, move to 2 meters, take another reading, 3 meters, etc. 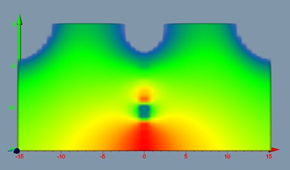 The effective depth is calculated as 50% of the probe spacing. 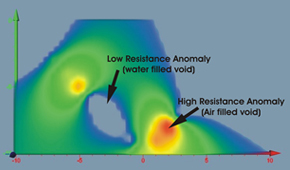 Anomalies are identified by large changes in the resistance (Ohms) readings. If the current runs through a void like a cave of tunnel, the readings (Ohms) will go way up. If the current goes through water or metal, the readings will go way down. 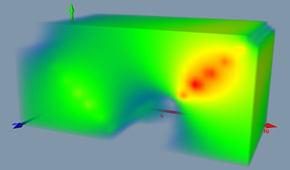 The EZ RES PRO supports all standard resistivity arrays such as Wenner, Schlumberger, Diplole Diploe, Gradient, etc. The EZ RES PRO will perform up to 5000 scans from 6 changeable C cell batteries and can store up to 300 readings on its on board data logger. The data can then be downloaded to a computer and imported into professional geophysical graphics programs like Voxler or AGI Earth Imager to produce REAL 2D and 3D images. If you are looking for a powerful and accurate machine to find underground anomalies at extreme depths, the EZ RES PRO is the machine for you! Just insert 2-4 probes into the ground, connect the wires, and press a button. It's that easy! Instant results are displayed on the screen and can be saved to memory for future analysis. 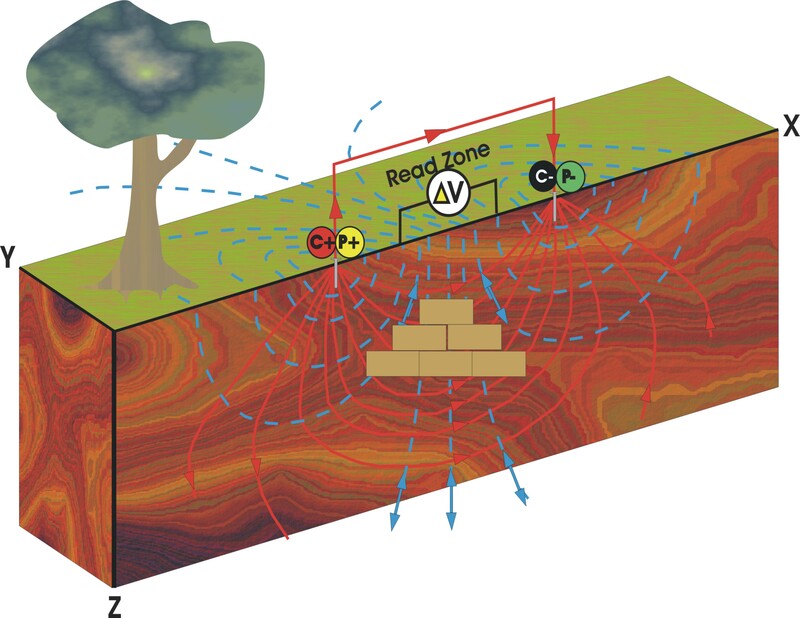 The EZ RES PRO resistivity meter uses a powerful 600v electrical current, that is sent into the ground via 2 - 4 steel probes, to accurately locate underground anomalies such as caves or tunnels, mineral veins and deposits, water deposits, or even buried caches at depths of 1 to 300 meters or more. Changes in the resistance of the electrical current are read in Ohms and immediately displayed on the screen. 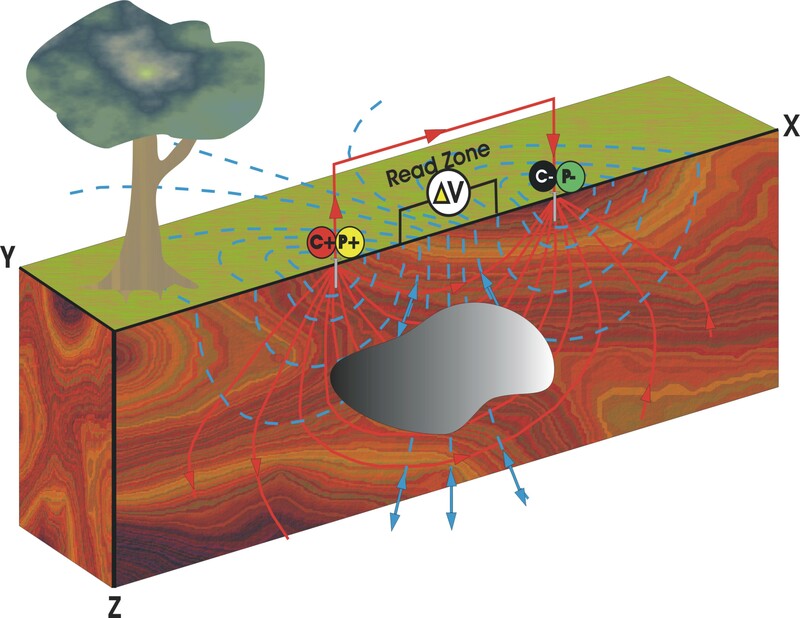 Anomalies that are less conductive, like a cave, will display a much higher Ohms value than the surrounding soil. Metal or water will show a much lower Ohms value. 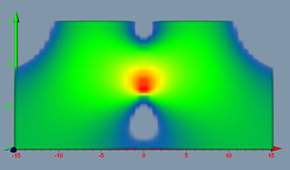 The depth of the anomaly is easily calculated by dividing the probe spacing by 2. So basically, if the probes are 10 meters apart, the effective depth would be 5 meters. The Data Obtained from the EZ RES PRO can be Used to Easily Create REAL 2D and 3D Images! With professional geophysical imaging software like Voxler or AGI Earth Imager, REAL images can be created detailing underground objects of interest. The EZ RES PRO produces real results, not gimmicks! Terra Exploration group tested the EZ RES PRO on a know cave in Austin, Texas. The cave was approximately 20 meters below the surface. Below is a picture of the entrance to the cave. We were able to climb to the top of the cliff to perform our resistivity survey. We began our survey with a probe spacing of 20 meters in order to obtain a depth of approximately 10 meters. Starting at a shallower depth than the target allows us to understand the normal soil conditions. Our first reading was 110.7 k Ohms. For our next scan, we increased the probe spacing to 40 meters. This would give us a depth ofapproximately 20 meters, which should be right in the middle of the cave. Our reading was 243.1 k Ohms which is more than double the initial reading of 110.7 k Ohms at 10 meters. This would indicate that we were definitely reading into the cave. With probe spacing set at 70 meters (35 meters depth) the reading was 391.8 k Ohms. At 80 meters probe spacing (depth of 40 meters) the reading was 391.0 k Ohms. With probe spacing of 90 meters (depth of 45 meters) the reading was 348.8 k Ohms. Notice how the number has gone down. This would indicate that we are getting into wetter soil. With probe spacing set at 100 meters (depth of 50 meters) the reading dropped considerably to 272.0 k Ohms. This would indicate water at the known depth of 50 meters. With the probe spacing set at 120 meters and again at 130 meters, the readings jumped back up to 492 k Ohms and 493 k Ohms, which would be much drier soil. This would indicate that the 100 meter scan was indeed in the pay zone of the water well. Upon further discussion with the owner of the well, we learned that it was indeed a small pay zone and not a very large amount of water. The EZ RES PRO was able to find it with no problems! Terra Exploration Group was contracted to attempt to find a lost tunnel in the Philippines that was dug during WWII to hide Japanese war loot. We began our resistivity survey in the area that was expected to have the tunnel and were able to quickly locate a high resistance anomaly at a depth of approximately 40 meters that would be consistent with a tunnel. We began to clear the jungle and uncovered a concrete cap that appeared to be covering a tunnel entrance. Our next step was to drill down to try and hit the tunnel. At a depth of approximately 40 meters, we pierced into the cavity. It was under a lot of pressure (we guess from decaying organic matter) and shot water and gas out of our drill hole for about 1 to 2 minutes. Due to the secrecy involved in the project, we were not present for the excavation but there were indeed tunnels found at the location and depth indicated by the EZ RES PRO. Above are a few of the photos that we are able to share.